One of the criticisms of the way the War Memorial has gone about promoting its plans to spend $498m of your money on extending its premises is that it has done so behind closed doors. The big launch on 1 November followed provisions in a couple of Budgets for scoping studies and some broad hints from Director Nelson in Senate Estimates. Consultation with the public was minimal and gathered ‘feedback’ from just 134 individuals. Director Nelson has been criticised in the Canberra Times (see below 14 April) for his failure to engage with critics. This has changed. Following the recent open letter and petition against the plans, the Memorial has seen fit to post on its website a 2017 consultant’s report (GHD) on options plus an Agenda Paper for a July 2018 Council meeting which discussed options. We’ll be reading this material closely, as will other people who are interested in the project. Of course you’ll rarely have full agreement on any project, minor or major. But more engagement with those who have expressed their concerns or opposition would strengthen the memorial’s case that it enjoys broad public support. Today’s Canberra Times – hard copy p. 35, hard to find online – says 64 per cent of those polled answered ‘No’ to the question ‘Are you comfortable with the Australian War Memorial receiving funding from companies which make weapons’. ‘Yes’ tallied 28 per cent and ‘Unsure’ 8 per cent. There were 403 respondents to this Canberra Times Insider poll, members of a panel of readers who give feedback each week. It sickens me that the War Memorial’s major theatre should honour BAE Systems, a merchant of war that has been creating so much death and misery in Yemen and elsewhere. It is quite wrong for the memorial to seek and accept funding from the so-called gun-runners. I suggest its administration has lost its moral compass. Explanation: (1) Honest History sees the issue of arms company funding of the Memorial as closely related to the campaign against the Memorial’s extensions. In both instances, the Memorial shows a disregard for public opinion. (2) ‘Gun-runners’ is a term used by senior Australian Defence Force officers to describe arms manufacturers. 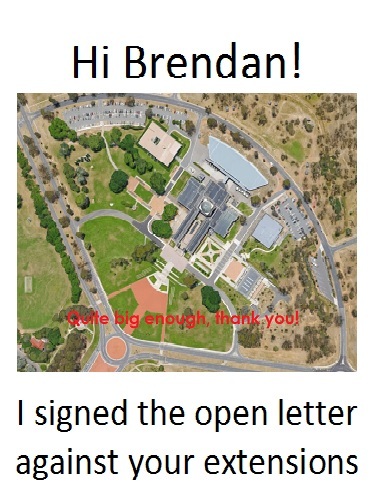 During his ABC Radio Canberra interview this week, War Memorial Director Brendan Nelson claimed that, of the 83 signatories to the open letter against the extensions, he had only ever seen three of us at the Memorial. This is hyperbole of the highest Nelsonian calibre. For example, I have visited the Memorial more than two dozen times in the six and a bit years since Dr Nelson took the job and, from a quick skim through the list of 83, I can see many others whose professional work, let alone private interests, would have taken them there also. Clearly, the signatories need to identify themselves, perhaps with a tee-shirt looking something like this. The War Memorial belongs to all Australians, not just ‘veterans and current service men and women’, yet its future seems to have been hijacked after minimal public consultation – just 134 individuals provided feedback to the Memorial’s consultation process last year – and on the basis of confused and inconsistent arguments. As Mr [Philip] Leeson [ACT Chapter President, AIA] said in the AIA statement, ‘If the Australian War Memorial’s management thought our and the community’s opposition to their destructive plans would simply fade away, they have grossly miscalculated’. More to come soon on naming rights. Anyone heard of the Kingold Education and Media Centre? Our petition on change.org against the proposed $498m extensions to the Australian War Memorial closed on 7 April 2019. It received 1236 signatures and we will now take steps to bring it to the attention of Bill Shorten and other relevant people. Of those who signed, 224 (18 per cent) made comments. We launched the petition following the extraordinary support received on Twitter after the front page story on 23 March in the Canberra Times and online in Nine (Fairfax) papers. David Stephens reports on the petition and what it showed. For people of my generation – I was born in 1949 and had relatives killed in both world wars – commemoration is not speeches by politicians, or parades and wreaths and children waving flags, or even emotive tours [of the War Memorial] with Dr Nelson; instead, it is something families live every day and every week, forever and down through the generations. People – of my generation or any generation – who grasp that fact do not need coaching in commemoration from Dr Nelson. And they do not need a bigger War Memorial. Opposition to War Memorial’s $498 million extensions grows; more than 80 distinguished Australians sign letter (23 March 2019). Includes the letter signed by 83 distinguished Australians and the list of signatories, as well as later media coverage. Open for comments. War Memorial Mount Ainslie land grab attracts opposition in Canberra (6 March 2019). Canberra Times poll shows strong opposition to War Memorial’s land grab of Remembrance Nature Park (2 March 2019). Opposition growing to Australian War Memorial’s ‘Brendanbunker’: watch this space (28 February 2019). Total Australian spending on the Anzac centenary is around $A600 million – or $1.1 billion if you include the proposed War Memorial extensions (19 February 2019). Dr Sue Wareham OAM, President, Medical Association for Prevention of War.